Jumboisation Is A Technique For Enlarging? What Star Trek Continuity Error Was Left Unexplained For 26 Years? Building anything big, be it an ocean-going vessel or a large passenger jet, is an expensive undertaking. In the case of ships, however, there is a way to get more ship for your money without starting from scratch with a brand new vessel: jumboisation. Unlike a plane, which is designed specifically for its size and weight at the start of the design process, boats are a bit more forgiving when it comes to modifications. While you can’t just slice a plane in half and toss in another 50 feet of seating, you can absolutely slice a boat in half and add in entire sections at a time. It’s not an easy job and it requires a specialized team working in a specialized shipyard, but the end result is far more economical than building an entirely new ship with the extra space included from the start. The method has been used on everything from cruise ships to tankers. The oil tanker the Seawise Giant, for example, was expanded via jumboisation, making it the longest ship (at 1,504.10 feet/458.45 meters) to have ever sailed the seas. 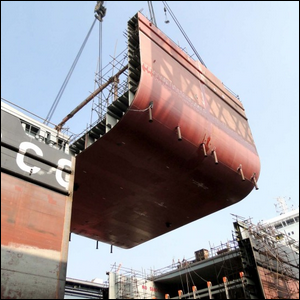 Image courtesy of Chengxi Shipyard Co.